A rent spike at its Ann Siang Road location forced Kki and store mates, The Little Dröm Store, into exile. Fans were dismayed by the indefinite closure of the cake store, while café owner Delphine Liau and Dröm’s Antoinette Wong and Stanley Tan went on the hunt for a new space. At the café and store’s new shared-again premises, hidden on the second floor of School of the Arts on the corner of Orchard and Selegie Roads, the demarcation between the two stores is a little more distinct. 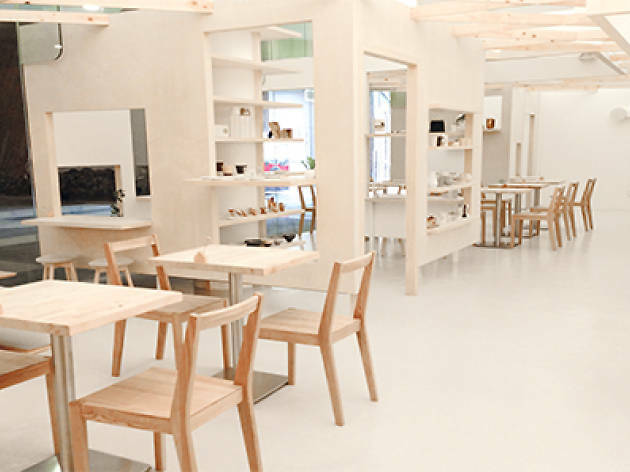 The café interiors still channel the clean, understated wooded zakka look, and a small retail space has also been carved out in Kki’s half, selling lovely but pricey Japanese plateware, including a collection of Kki Home plates, created in collaboration with Japanese ceramics maker, Kihara. The pretty pastries at the cake counter haven’t changed. The white chocolate and mango-filled Antoinette ($8.80), Onigiri cake with basil, chocolate and blood orange and L.R.R.H ($9.80), a tiny tower of glossy dark chocolate mousse with raspberry, are still ethereally light. Japanese tea maker, Lupicia, replaces the previous offering of Gryphon tea ($4.80).